A jubilant Toronto Croatia won the CSL Championship with a 4-1 total goals aggregate victory over Serbian White Eagles in the 2-leg final. Croatia had just one loss in the 2007 five-month long campaign. TORONTO - Toronto Croatia didn't score a goal in the second leg of their Canadian Soccer League championship series with the Serbian White Eagles. It turns out they didn't need one. Croatia and the White Eagles drew 0-0 Sunday in the second leg of the CSL final Sunday, meaning Croatia's 4-1 victory in Saturday's first leg was enough to give the Mississauga, Ont.-based team the title. The title run capped a stellar season that saw Toronto Croatia lose just once in CSL regular season play, a 2-0 loss to the Canadian Lions on Oct. 5. Toronto Croatia also won a tournament in the summer in Zagreb, Croatia, for Croatian teams from Canada, Austria, Germany, Australia the U.S., and France. 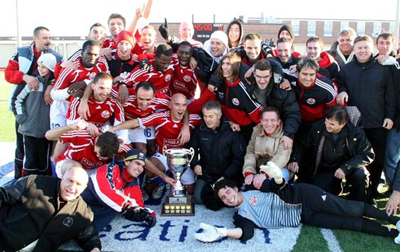 Toronto Croatia previously won the title of the semi-pro league in 2000 and 2004 when the league was the Canadian Professional Soccer League, but is best known for winning the North American Soccer League championship as Metros Croatia in 1976. In the first leg, Croatia midfielder Jonathan Bustamante scored twice, with Peter Curic and Hayden Fitzwilliams adding singles. Defender Dragorad Milicevic scored the lone goal for the White Eagles. While goals were plentiful in the first game, Toronto Croatia's defence stepped up to prevent any White Eagles comeback in Game 2. The White Eagles striker duo of Gabriel Pop and Sasa Viciknez had many chances, but could not cut into Toronto Croatia's aggregate lead. The CSL championship was originally slated to be one game, but was changed to a two-game series format to separate rival fans and avoid ethnic tensions. In 2006, fans became disruptive during matches involving the two International Division rivals. Game 1 was attended by Toronto Croatia fans, while the second leg was for fans of the Serbian White Eagles.